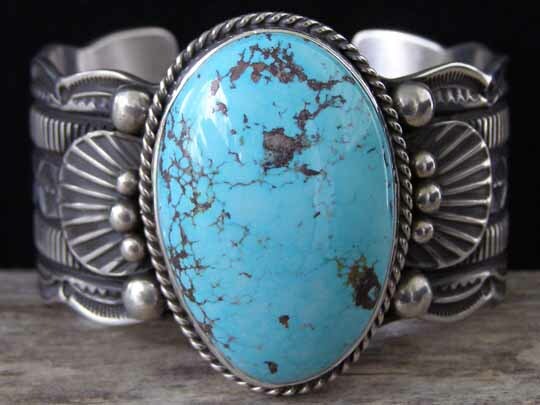 Guy Hoskie Bisbee Turquoise Bracelet size 6"
This single-stone bracelet is set with a perfect egg-shaped stone of natural, untreated Bisbee turquoise from Arizona. This is a thick, beautifully cut stone in a soft shade of blue mottled with brown matrix. No one cuts an egg-shaped stone like Bruce Mead because Bruce cuts such a stone from a particularly thick piece of natural rock. This means that he has enough thickness and dome to the cut so that it truly resembles an egg that is sliced in half. A single-stone bracelet must be set with the very best of stones and this piece perfectly illustrates that requirement. This isn't simply a piece of turquoise; it's a mineral specimen of the highest order. We pick from among our largest stones in making such a one-stone bracelet and we pick our very best; thick, carat-heavy stones of extraordinary color, cut and polish. We gave this stone to Guy Hoskie and specified the size and width of the cuff; leaving him to determine how best to flatter the stone through his use of deep, biting stampwork and decorative elements such as twist wire, appliquées and raindrops. Designed and made for a small, slim wrist. Stone: 1 9/16" x 1"